Ancient Greece was the center of the wine universe. Contemporary Greece is on the verge of economic collapse, with households and businesses struggling to stay afloat amidst the government’s potentially imminent default on its debt. Can the Greek wine industry play any measurable role in getting the country back on its feet? Undeniable, however, is how far the nation’s wine industry advanced in the last three decades of the 20th century. From a tradition-bound, domestically-focused business, Greek winemaking modernized on several fronts. A sophisticated appellation scheme was created, designating four levels of quality. Grape growers and wine makers trained abroad and returned home to implement new techniques and put unexploited land into cultivation, in turn attracting outside investment. The quality of the final product improved, previously-obscure native grape varieties began to shine, and exports climbed—although Greek wine exports remain a tiny fraction of those from powerhouse producers like France. In 2014, a lower-than-normal volume year for the region, Burgundy alone exported some 279 million bottles of wine. Exports from all of Greece in 2007 (the most recent figures I could find) totaled some 46 million bottles. Producers that can are continuing to export despite the financial crisis, giving U.S. oenophiles access to good and interesting Greek product—at restaurants like New York’s Thalassa, for instance (whose wine list, sadly, is not currently posted on its website), and from retailers with a deep international bench. Merchants like Sparrow in Hoboken and Sherry-Lehmann in New York offer a virtual tour, via local reds (Xinomavro, Agiorghitiko) and whites (Moschofilero and Malagousia), of Macedonia and the Peloponnese. But many aspects of a modern, export-oriented wine industry seem to have gone dormant in Greece in recent years. It is difficult to unearth up-to-date production statistics. A website called Hellastat that used to publish Greek wine import and export numbers is defunct. The Athens Chamber of Commerce and Industry posted an informative account of domestic wine production, consumption and exports, but it covered the late 1990s and was published in 2005. Adding to the country’s, and its wine sector’s, economic woes, lousy weather in 2014 cut last year’s production by between 15% and 30%, depending on the region. The country’s dire straits make it difficult to thrive in the wine or any other business in Greece today. Wine lovers may have to wait for a better economic climate to attract the entrepreneurs with the drive and enthusiasm to reinvest in the industry. Until that day, I can’t resist reviving an old proposal for Greek restoration: make Greece the permanent home of the Olympics. 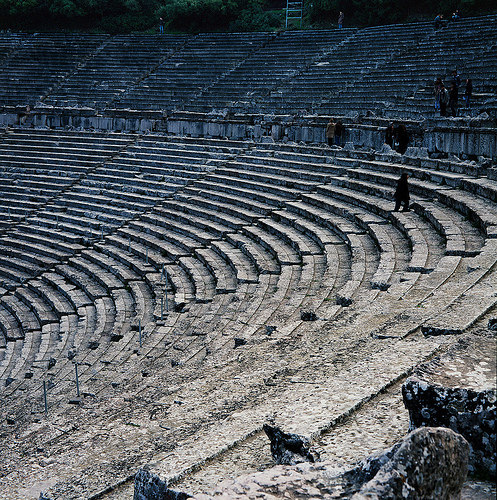 With prospective host cities losing interest because of the enormous investments and disruptions required (case in point: Boston for 2024), and some previous hosts regretting the expenditures made for now-idle infrastructure, the time may have come to shake up the IOC system and build permanent Olympic facilities in Greece. Just imagine how much Greek wine those biennial hordes of Olympic visitors would consume!